I ended up stopping at pg. 124 around 38% in. This is the first time I’ve read Ms. Drake and a book in the True Heroes series. Their are previous characters around, ones that are couples now and friends to our leads, and so I’m missing out on the connections. I don’t feel the camaraderie or friendships like I might if I read the books in order. As for Absolute Trust everything feels slow. The plot is slow and the romance is nonexistent. Even with them both having torches for each other since high school. I’m just not feeling the the chemistry and romance. Up to this point no action has happened. We’ve had a car booming and an attempted apartment burglary/try to kill our heroine, but it wasn’t action associated, just things that happened to our leads, then we move on. I’m not sure if I’ll try reading this again. 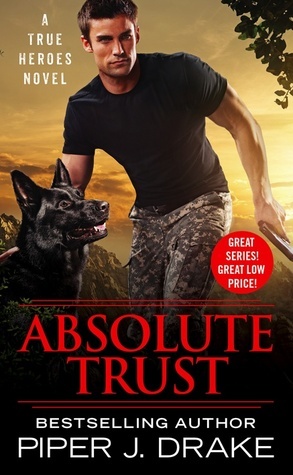 I do have book one on request at my library and maybe I’ll pick up Absolute Trust again after I try out the previous books published. Sorry this didn’t work for you Angela. I totally get why, though, and would probably have stopped reading, too. I want there to be more than torch-bearing when we are almost half-way into a romance. It happens now and then. I’ve read both books 1 and two now and I know I won’t be rereading or trying to rereading this one. The first one was meh and the second just ok. Thank’s or stopping in. Oh that’s too bad. I read book one and had fun with it but then lost track of the series. Their are only three books in the series. Hope’s Crossing Kennels only has three main guys that came together to start the Kennel/Training facility. I’m currently reading book 2 Ultimate Courage. I finished book 1 and it was just meh to me. It’s not looking promising to try and read 3 again. The was my least favorite of the series. Book 1 was GREAT! I just finished book one and it was so so for me. The except that’s in book one though, for book two has me intrigued.